Home News MH370 MH370: Can a deal be reached to renew the search? 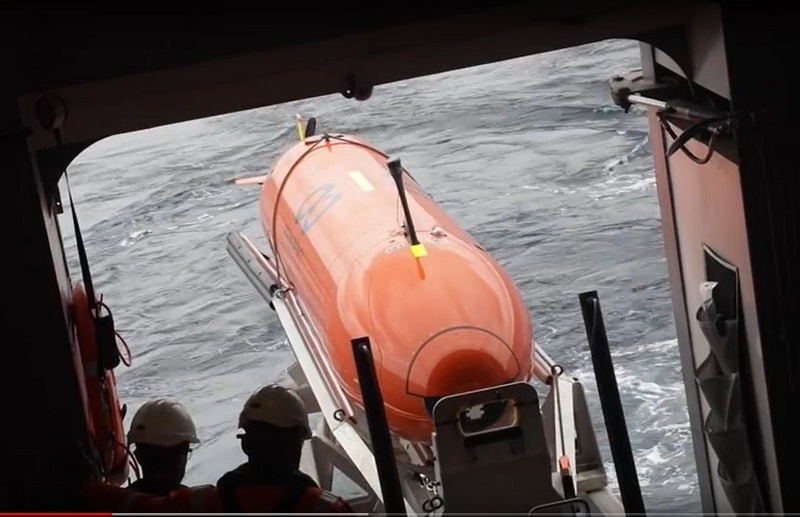 The Hugin autonomous underwater vehicles being deployed to search for MH370. Photo: Ocean Infinity. It will take two to tango to restart the search for MH370 but the key question remains: can you get both partners on the dance floor? The Malaysian government made all the right noises during the recent remembrance ceremony for the fifth anniversary of the March 8, 2014 disappearance of the Boeing 777 with 239 souls on board. Prime Minister Mohamed Mahathir gave a surprising 30-minute audience to family member Danica Weeks under the glare of cameras from high rating current affairs show 60 Minutes. Transport Minister Anthony Loke sounded as though he had softened his stance on restarting the search by declaring he would entertain new proposals if there was new technology. But always there was the proviso about credible new leads and the problem is once again deciding what that means. Was this just window dressing for the MH370 fifth anniversary or are the Malaysians genuinely resolved to find the wreckage? 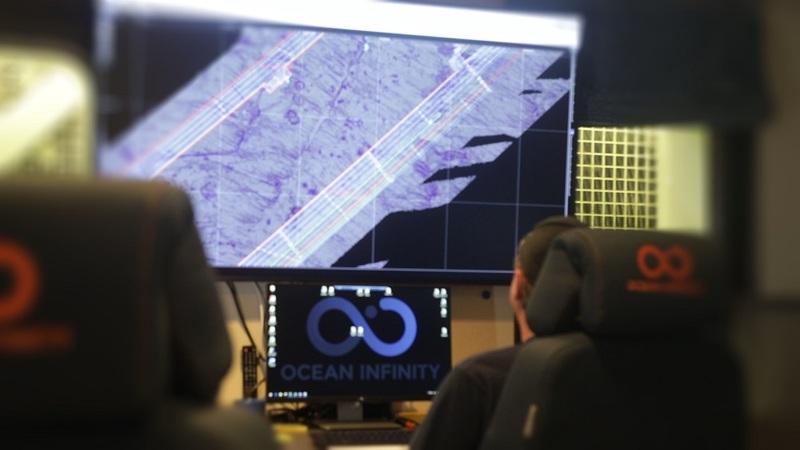 Ocean Infinity has declared itself ready to resume the search on a no find, no fee basis and has also been developing procedures to search more efficiently. READ: Ocean Infinity stands ready to resume the search. 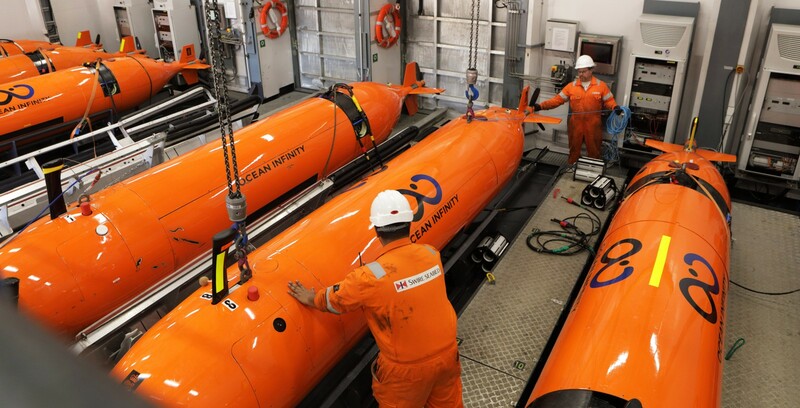 Ocean Infinity chief executive Oliver Plunkett believes that the Malaysians have continued to think about how to find the plane and says his organization has been doing the same. Hardly a day goes by, he says, where the company does not receive suggestions and propositions. It looks at all of them, although some can be quickly dismissed. “But we’re constantly thinking about it and regularly analyzing different ideas and different theories so that if that moment comes, we can form a view,’’ he says. Plunkett is among those that think the Australian Transport Safety Bureau did the best it could with the information it had in setting the original search area and helping to define the second search. The Malaysians shouldered 60 percent of the $A200m cost of the original 120,000 sq. km underwater search but they brought in the ATSB to lead the search. There was scant evidence available when the search was launched and, despite some criticism some quarters, those involved have been recognized by their peers for the work, inspiration and dedication involved in that effort. The experts with whom the Australian Transport Safety Bureau worked included aircraft manufacturer Boeing, Australia’s Defence Science and Technology Group (DSTG), the UK Air Accidents Investigation Branch, the US National Transportation Safety Board, Inmarsat, and French aviation technology company Thales. They used seven handshakes between the plane an Inmarsat geostationary satellite over the Indian Ocean and a ground station in Perth to give them some idea of where the plane might be. It wasn’t much but it was enough to work out through the delay in the signals between the plane and the satellite — a phenomenon known as burst timing offset — a series of circles on which the plane must have been when the handshakes took place. Investigators combined this with the known fuel and operating characteristics of the Boeing to reduce this to an arc, but this still cut a vast swathe across the surface of the Earth and extended as far north as Kazakhstan. A second breakthrough came when experts were able to use changes in frequency, or burst frequency offset, to determine which direction the plane had headed. This involved a highly sophisticated treatment of Doppler shift, the same phenomenon that results in an increase and decrease in pitch people hear when a fire engine goes past. A key to the hypothesis was that the plane was uncontrolled when it crashed and simulators pointed to the aircraft descending in a spiral involving wave-like oscillations close to the seventh arc. READ our extensive MH370 coverage in one place. The search took two years and was ultimately unsuccessful. But as pieces of the wreckage were found and drift studies were done the evidence indicated the aircraft could have crashed further north than first thought and a new search area was defined. This prompted the Malaysian government to accept a proposal by the then little known Ocean Infinity to do a second sweep using innovative technology it had developed for ocean surveys. OI had developed a technique for running several Kongsberg Hugin autonomous underwater vehicles (AUVs) in a pack to allow it to sweep areas significantly faster than had been previously possible. These torpedo-shaped robot submarines can dive to depths of up to 6000m, search autonomously and bristle with detection gear that includes a side scan sonar, a multi-beam echo-sounder, a sub-bottom profiler, an HD camera, synthetic aperture sonar and other sensors. A Hugin autonomous underwater vehicle is launched. Photo: Ocean Infinity. The company would use a leased ship, the Seabed Constructor, and a fleet of up to eight UAVs to scour another 120,000 square kilometres of seabed in record time. “We were consumers of ocean search services and we were involved in a project in which AUVs were used,’’ says Plunkett. “Born of that that was the idea that you could use them as a fleet and deliver high resolution, high quality, high speed, high-value survey services in a way that nobody else in that industry was doing. The company offered to perform the search on a “no-find, no fee” basis that would see it paid up to $US70 million if MH370 was located, depending on where and when the wreckage was found. Plunkett says a mix of things prompted the search company to make the offer, including the global resonance and widespread awareness of the story. It was an obvious project for a company setting sail to become the world’s leading subsea survey and deep-water exploration company. This would eventually lead to other projects such as OI’s successful search for the missing Argentine submarine San Juan and South Korean ore carrier Stellar Daisy. By this, Plunkett is referring to the way the search firm engages with the families of those missing in the various tragedies. He believes the humanitarian aspect of the search matters and says this was one of the reasons the Seabed Constructor continued the search even after the Malaysians had called an end to it. OI started the search with high hopes after the CSIRO identified search hotspots it was hoped would lead to the wreckage. The company searched without success those and other areas identified as having a higher probability of being the crash site. Like the team before it, however, it was forced to face devastating defeat. “We had, and continue to have, a high level of belief in the expertise of our team, the quality of our equipment and our ability to perform on those projects’’ he says. “So having gone into it from that perspective and got to the end and having had to leave without finding it … was devastating actually. 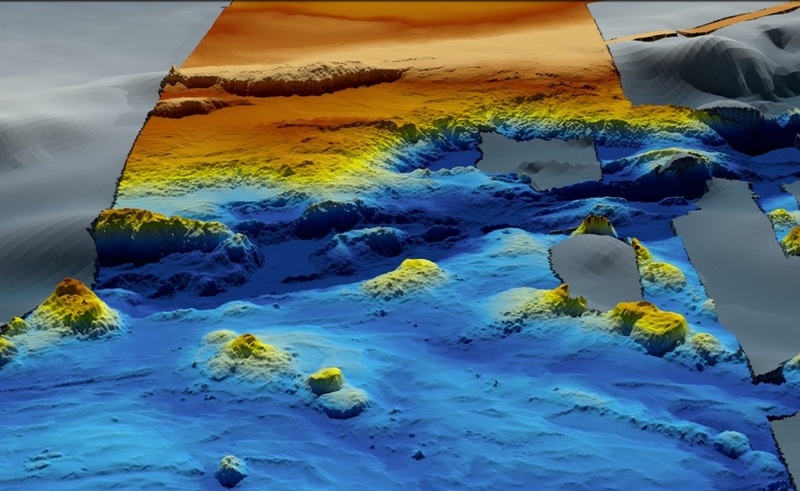 A 3-D map of the ocean floor from the MH370 search. Image; Geoscience Australia. One of the major arguments about the final minutes of MH370 is whether it was controlled by a pilot or uncontrolled when it plunged into the sea. Drift studies, as it turns out, don’t care. They are trying to back-track from the positions where the debris lands — in this case the East Coast of Africa and islands off its coast — to define a potential crash site. It is not an exact science in terms of accuracy and while three independent drift studies arrived at the same broad area they disagreed on the details. While none of the best guesses made by scientists undertaking the drift analyses uncovered the wreckage, there remains a belief it is somewhere in that area. There are plenty of other theories ranging from the inevitable aliens to complicated conspiracies. Some defy all evidence, such as a claim the aircraft lies intact on a Cambodian hillside. CSIRO scientist David Griffin, who did the extensive drift modeling that suggested likely hotspots for the wreckage, does not believe it is north or south of the existing areas swept by searchers. He said last year any suggestion the wreckage is north of 25°S or south of 39.6°S was inconsistent with drift modeling as well as satellite communications data and flight path simulations. But Griffin did not claim to know where it was. This is not necessarily the case with pilots and others who support the controlled ditching theory. Despite the drift studies, some believe the plane is 7000 square kilometre region at the southern end of the original search area and have been vociferous in their claims it should have been thoroughly searched. They also disagree with an ATSB analysis that the flaps were retracted when MH370 went down and that analysis of the satellite signals suggest it was in an uncontrolled spiral. Ocean Infinity met with representatives from this group but Plunkett says the region was not part of the pre-determined search area given to it by the Malaysian government. However, he says that does not mean it does not make sense to look at the area at some point in the future. Other people believe MH370 is just outside the existing search area, including the man who headed the first search, Peter Foley. Although he has left the ATSB, Foley remains committed to finding the wreckage after dedicating so much time to the project and says he will do whatever he can “to help make it happen”. “My gut feeling is if we missed it, we didn’t miss it by very much,’’ he says. Foley still does not discount the possibility that the searchers passed over the wreckage but it was not picked up in the data and it could be hiding in a geological feature such as a canyon. He notes the San Juan looked like a piece of geology in the sonar imagery and searchers passed over it several times before it was located. “Coverage was extremely high in the are we believed at the time was most likely to contain MH370 but some of that area is still pretty tough geology and you can’t be absolutely certain it’s not hiding in a rocky field,” he says. Nonetheless, Foley remains confident the airliner will be found. “Of course it will,’’ he says, adding that there is an ongoing improvement in technology such as sonar as well as search techniques. 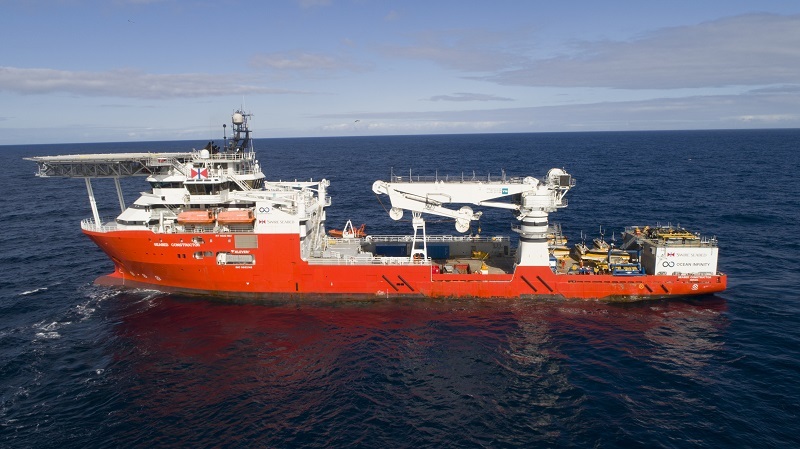 Ocean Infinity has not been standing still and over the past year and in addition to revising its search procedures, it has also been ramping up its fleet. It still has the Seabed Constructor under charter, but this has been joined by a second ship, Island Pride, and a third will be joining later this year. “So by the end of the year, by September, we’ll have three ships each of which will have five AUVs, two surfaces vehicles, a deep water winch, a deepwater crane and two deepwater RAVs. This includes the potential not just to find MH370 but to retrieve the black boxes. Whether even that would provide answers remains to be seen. There is no guarantee that the plane’s cockpit and flight data recorders will be found even if the wreckage is located or whether the experts will be able to extract data from them. One hope is the extreme depth and the lack of oxygen may help preserve the devices but no-one can say how they may have fared after five years. But first the wreckage must be found and Plunkett is another who believes it might be just outside the search area. While he says none of the MH370 data are as compelling on their own as that available for the San Juan and the Stellar Daisy, combining the work on the seventh arc with the drift analysis suggests it’s somewhere in the area already searched. So does the OI boss have a theory as to what happened? While he appreciates that this is a question that grips the public, he says: “I truly don’t”. “My theory is that a plane disappeared, that’s it. Why, how or who would be pure speculation and I just simply don’t do it.